Should Catalonia become an independent state? The vote was a milestone in the century-long struggle for self-determination in Catalonia, a region in northeast Spain. The claim for independence, though, was again met with opposition by the Spanish government, with Spanish police seizing polling stations and beating would-be voters. Catalonian President Carles Puigdemont said on Monday that Catalan “citizens have earned the right to [be] an independent state”. Puigdemont sees the 90% referendum win as a self-evident claim for independence. Catalonia’s claim to independence is historical. It has always considered itself a distinct entity. While Catalonia has co-existed with Spain for centuries, the 1979 Statute of Autonomy under the 1978 Spanish Constitution permitted Catalonia some autonomy, with self-government of education, health care and welfare. Catalonia has also maintained a culture and language distinct from its Spanish neighbours. 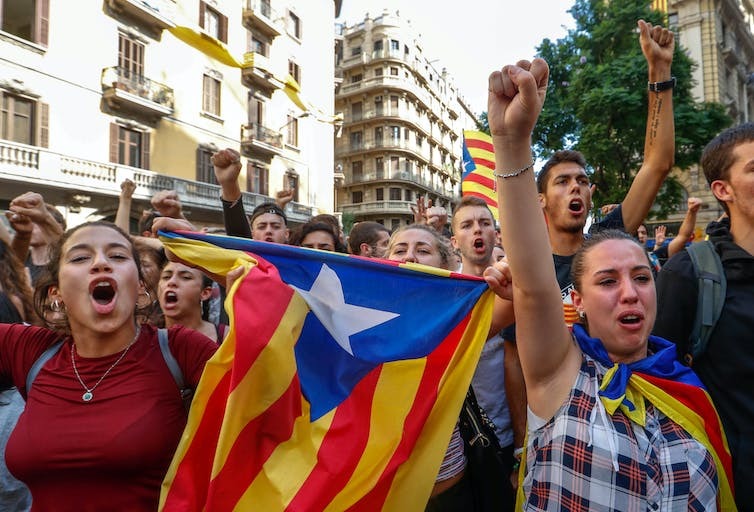 For Catalans, strong national identity has been demonstrated through resistance of repressive expressions of Spanish influence – notably the Franco dictatorship’s attempts to suppress Catalan culture and language. As one of the strongest and most productive economic regions in Spain, the perception among Catalans is that they give more in tax than they receive in state benefits. In 2015, 20% of Spain’s total GDP came from Catalonia, while the state budget for Catalonia received a 6.5% decrease from 2003. The current Catalan claim for independence has been energised by the perceived economic and political repression of the region by the central government in recent years. Many Catalans believe Catalonia would be more successful if it could self-rule. Parallel to inequitable economic treatment, the Spanish government has also moved recently to tightly constrain Catalan autonomy. In 2010, the Spanish Constitutional Court struck down an expanded version of the Statute of Autonomy that granted Catalonia the title of a “nation”. In March 2017, former Catalan leader Artur Mas was banned from holding public office after being found guilty of disobeying the Constitutional Court by holding a symbolic referendum in 2014. Such aggressive responses by Spain to the idea of secession have driven increasing numbers of Catalonians toward the independence movement. 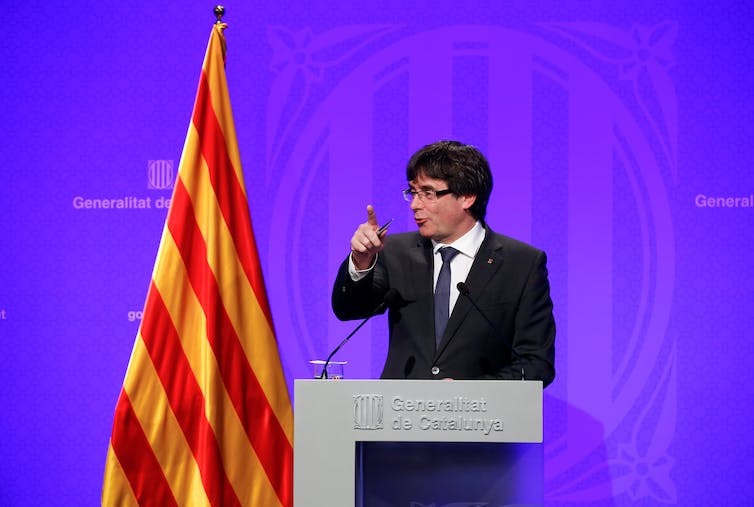 In the context of Sunday’s referendum, Puigdemont argued that his people’s sovereignty lies with the Catalan parliament, and that no other court or political power could ban or suspend the vote. The referendum’s legality is certainly contentious, notably because it did not adhere to democratic conventions like the requirement for a minimum threshold of votes. Regardless, Puigdemont is looking to make a declaration of independence in the coming days. Catalan President Carles Puigdemont spearheaded the independence referendum. Why does the Spanish government oppose Catalonian independence? There has not been a self-determination referendum in Catalonia. Rajoy labelled the referendum as a “constitutional and democratic atrocity” and slammed the Catalan leaders for creating “serious damage to co-existence” between Spain and Catalonia. In line with the 2010 Constitutional Court decision, the Spanish government opposes Catalan independence on the grounds of constitutional invalidity. The 1978 Spanish Constitution denies the independence of Catalonia, declaring the “indissoluble unity of the Spanish nation”. Madrid argues there is no provision in the Spanish Constitution for self-determination, and that a unilateral vote of independence is at odds with Article 155’s requirement for democratic participation of all Spaniards. On these grounds, the Constitutional Court banned the referendum – which nevertheless proceeded on Sunday. What happened during the referendum on Sunday? Sunday’s referendum was marred by violence and repression. Spanish national police forcibly blocked voting, seizing ballot boxes and voting papers, physically removing voters from polling stations, and attacking civilians with batons and rubber bullets. Catalan emergency officials say that 761 Catalan civilians and 12 police were injured during the police actions in Barcelona and Girona. Catalan and Spanish leaders blame each other for the violence. 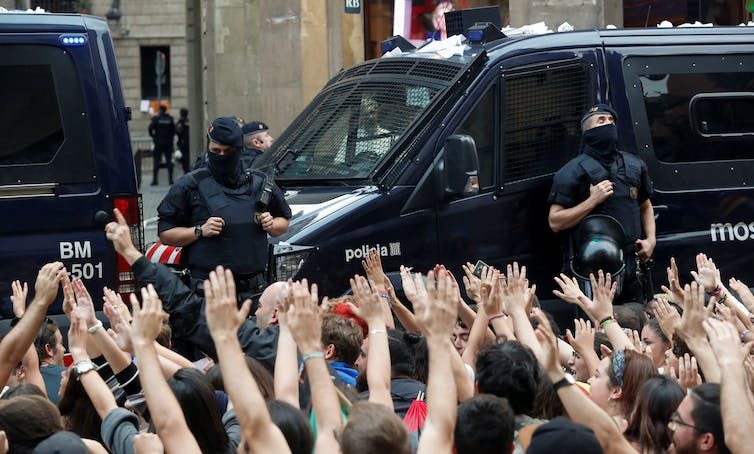 Rajoy condemned the Catalans for their “radicalism and disobedience”, praising the Spanish police for their “firmness and serenity” in response. This response sits uncomfortably with images of voters being removed from polling stations by their hair and attacked with batons while raising their hands in peaceful protest. The UN has criticised Madrid for its disproportionate and violent response to a peaceful attempt at self-determination. Human Rights Watch has condemned the Spanish government for violating Catalans’ civil right to peaceful assembly and free expression. In contrast, the European Union regards the vote as illegal but has called for unity and peaceful relations between Spain and Catalonia. As Catalans call for a national strike in response to Madrid’s repressive actions, the world waits to see whether this act of protest will be met with greater repression. Madrid could use emergency powers to take full administrative control of Catalonia. 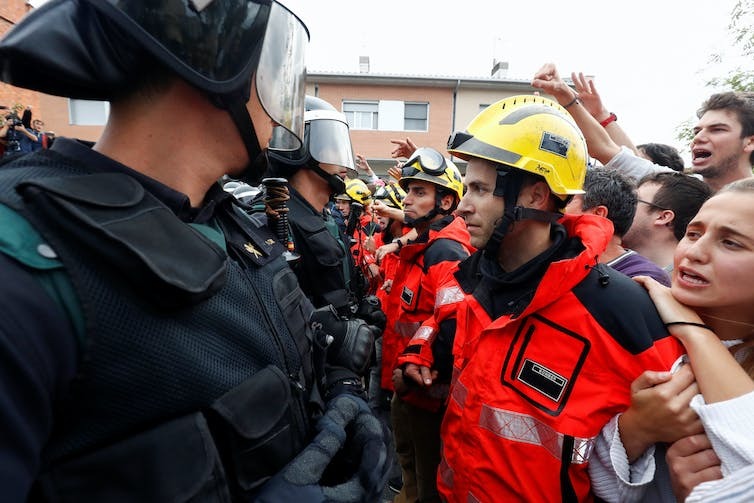 Catalan firefighters formed a human shield protecting voters from Spanish police on Sunday. … have sent a message to the world, we have the right to decide our future, we have the right to be free and we want to live in peace. Catalonia is effectively asserting the right of its people to self-determination. This is a collective human right, enshrined in common Article 1(1) of the twin human rights covenants – the International Covenant on Civil and Political Rights and the International Covenant on Economic, Social and Cultural Rights. In voting at a referendum and preparing for a declaration of independence, Catalonia is following a similar contested path to the emerging state of Kosovo. In 2010, the International Court of Justice found that Kosovo’s declaration of independence did not violate international law. Spain is the only major country in Western Europe to refuse recognition to Kosovo as an independent country. Spain’s insistence that unilateral secession cannot be permitted for Kosovo is intertwined with its determination not to lose Catalonia. Self-determination can be realised in a range of ways, including through forms of autonomy within a nation-state. It may be that a negotiated arrangement that would preserve Spain’s sovereignty over Catalonia would still be possible. However, by meeting Sunday’s assertion of self-determination with repression, Spain has undoubtedly fuelled Catalonia’s determination to establish an independent state. Other EU member nations, including the UK, will be watching with concern that Catalonia may inspire separatist movements in Scotland, Bavaria and Flanders. National Police station in Barcelona. 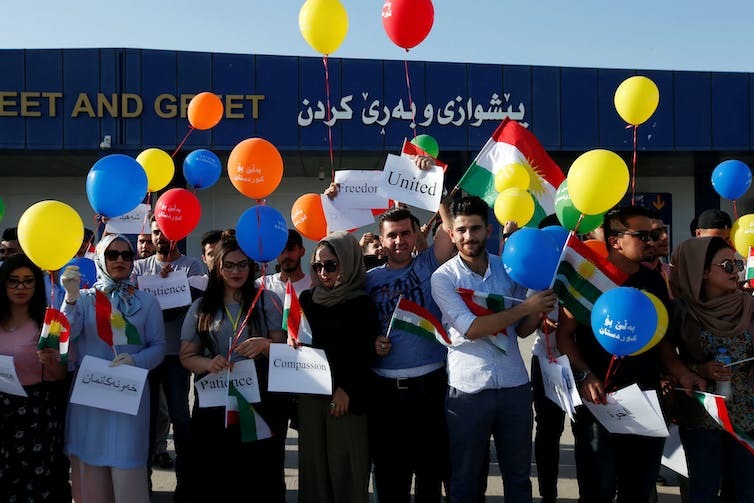 Kurdish people protest outside the Erbil International Airport in Erbil, Iraq. Spain plays a relatively inconsequential role in the fight against Islamic State. Despite its (relatively) low body count and primitive execution, Thursday’s terrorist attack in Barcelona shocked many local and international onlookers. 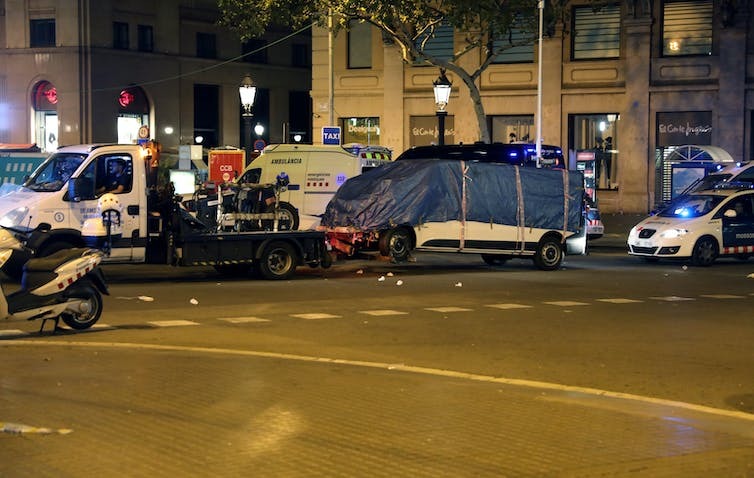 The Islamic State (IS) group was quick to claim responsibility for the attack, in which a van was deliberately driven into pedestrians on Barcelona’s famed Las Ramblas strip. At least 13 people are dead, and around 100 have been left injured. The location and targeting of the attack deviates from IS’s previous efforts. These have typically focused on punishing countries directly involved in military operations against it in Syria and Iraq. But how reliable are its claims of responsibility? And why was Spain chosen, given its relatively inconsequential role in the fight against IS? Verifying the culpability of terror attacks can traditionally be a tricky affair. Given that organisations that engage in terrorism are doing so from a position of weakness, there is always an incentive to lie in order to bolster mystique and inflate the image of threat. But in this regard, IS seems to differ from previous groups. It has typically been reliably truthful in what it claims to have been its actions. One Australian example of this can be found in the 2014 Lindt Cafe siege. The perpetrator, Man Haron Monis, proclaimed he was acting under IS auspices. But despite this declaration, and the potential propaganda victory it could bring, IS resisted such advances and distanced itself from the incident. While IS would go on to posthumously praise Monis’ actions, it never made any explicit claims to having organised or directed them. No pre-existing relationship was found in the subsequent inquest. This incident, along with many others, seems to indicate that while IS claims a butcher’s bill of heinous activities, it doesn’t tend to overtly lie about them. Such a policy, while initially appearing counter-intuitive, maintains IS’s perception as a trustworthy source of information. This is particularly important in recruitment efforts, and makes it difficult for governments to challenge the IS’s claims in counter-propaganda. For IS, maintaining a twisted sense of chivalrous virtue remains paramount. The Barcelona attack also reflects IS’s view of the world as a civilisational clash. Described as a “reluctant partner” in the anti-IS coalition, Spain has resisted entreaties to join military efforts. Instead, it has opted for what it sees as a less risky role – providing logistical aid and training to local Iraqi forces, as well as preventing homegrown attempts to support IS abroad. Spain’s limited role in the fight, particularly in contrast to other terror victims such as France and the US, might lead one to expect it to be relatively low on IS’s hit list. But in terms of IS’s conflict narrative, Spain represents just another manifestation of a hostile Western civilisation in a state of war against the Islamic community. This leaves it more than open for reprisals. At a spiritual level, Spain also holds a special place in IS’s mythology. Once a part of the Islamic empire, al-Ándalus, as it is known in Arabic, is seen by many IS ideologues as a natural territorial part of the end-state caliphate and currently under direct occupation by infidels. Terrorist reprisals like this attack are likely to intensify temporarily against Western targets throughout Europe and further abroad over the coming months and years, as the IS is systematically deconstructed on its home turf in Iraq and Syria. IS remains heavily dependant on an image of defiant dynamism and a commitment to challenge the international status quo, which it claims subjugates the chosen community. As its ability to function as a “state” continues to decline, it will increasingly seek to maintain such a mystique through acts of spite against those that have prevented it from achieving its goal of a “caliphate”. Despite a likely future increase in terrorist attacks, IS also risks a growing public disinterest and apathy toward its activities. As one commentator has written, the banality and nontheatrical nature of IS’s approach to terrorism – particularly in contrast to al-Qaeda’s keen eye for spectacular symbology – has left many onlookers less than impressed and far from terrified. At least 16 people have died, and scores more have been injured, in a terror attack on Barcelona’s Las Ramblas strip. Barcelona 2017, London 2017, Berlin 2016, Nice 2016. In all of these cases the weapon of choice was a vehicle, driven at speed, into crowds innocently going about their daily business. 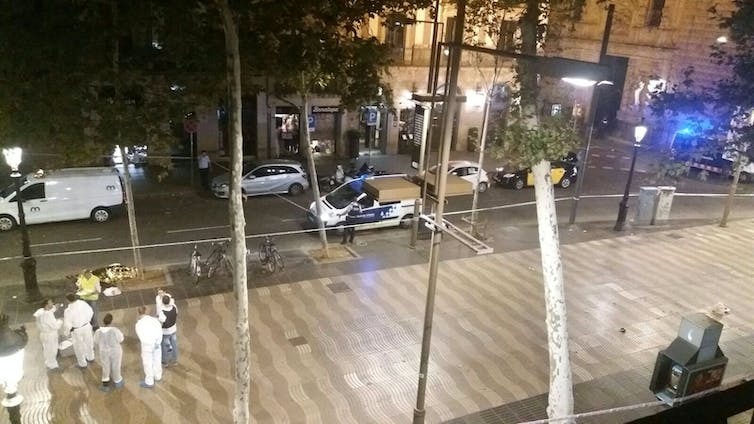 Barcelona is just the latest in a series of targets of Islamic terrorism over the past year in which a vehicle has been used to mow down those in its path indiscriminately. In all of these cases Islamic State (IS) has claimed responsibility. These sorts of terrorist attacks – like the 2001 al-Qaeda plane attacks on targets in New York and Washington – have elevated threats to the civilian population in urban areas to a new level. In the latest – on Barcelona’s famous tourist precinct near Plaça de Catalunya and Las Ramblas in the heart of the city – at least 16 people have died and scores more have been injured. The death toll is likely to rise. Terror is filling the hearts of the Crusader in the land of Andalusia. Another outlet warned that Spain was now grouped with the UK and France as terrorist targets. The use of vehicles in relatively vulnerable locations where crowds gather, to inflict maximum harm on innocent people, will add significantly to unease across Europe. This anxiety will now reach new levels of intensity, with German elections due on September 24, and and a Catalan independence vote on October 1. This latest attack will cast a shadow over events that will require people to gather in crowds either to participate in political campaigning, or to vote in the election itself. More broadly, the use of vehicles as weapons against urban populations will add to security concerns in Western capitals – including in Australia. What’s likely to come as a result are further security measures to combat the risk of vehicular attacks in crowded locations. But we know how difficult it is to prevent such attacks. In Melbourne, Australia, for example, authorities have installed bollards around the city to guard against these sorts of acts. But ensuring people’s safety in free and open societies represents a huge challenge. World leaders have condemned the Barcelona attack, but beyond pro-forma statements of support the reality is that the scourge of Islamic-inspired terrorism is here to stay for the time being. These acts of violence, each one encouraging another, are part of a terrorist landscape. They will remain so especially at a moment when IS is under enormous pressure in its stronghold in Syria. The expulsion of IS from Raqqa in eastern Syria will not lessen threats of terrorist violence in the West. Instead, it will probably heighten the risk. What the Barcelona attack reminds us is that the West is embroiled in a long war against Islamic terrorism. Enhanced counter-terrorism strategies, making use of sophisticated technology, will lessen risks, but cannot entirely eliminate the threat in open societies.